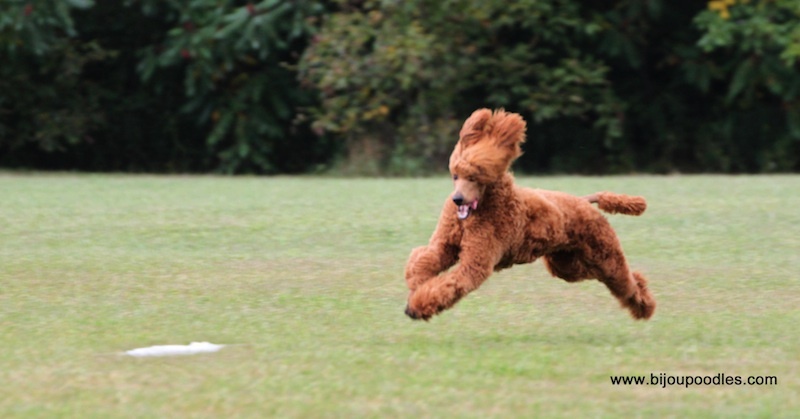 You have decided you would like your Poodle to run with you. five minutes per month of life, so if your puppy is 5 months old then "WALKING" 25 mins per day. Your puppy will NOT be able to run formally with you until they are a 2 years of age as their bones and muscles are still growing. Do not force them to walk to keep up to you, as you can risk permanent injury. but what they don't realise is that a Poodle will try to keep up to you until it dies. They won't tell you they are tired. It is up to the owner to use common sense. !! USE COMMON SENSE !! Just like many of us did not go from the couch to running 3 miles straight, same is true for your trusty companion. after all they love to please us, you must be aware that it takes time to build up the stamina to run the distances you are accustomed to running. 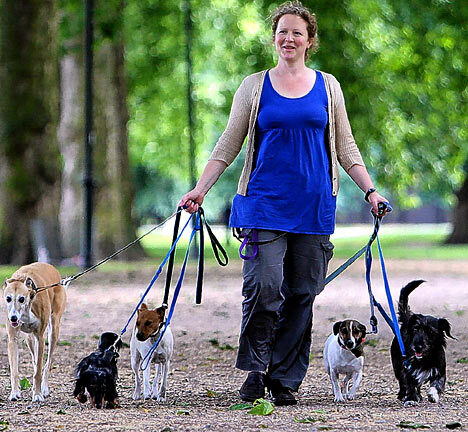 So start with some walks, to allow time for your dog to adapt to the routine of going out with you. Just like any athlete that starts to work out, you may also wish to have the Vet go over puppy, before you start road working. 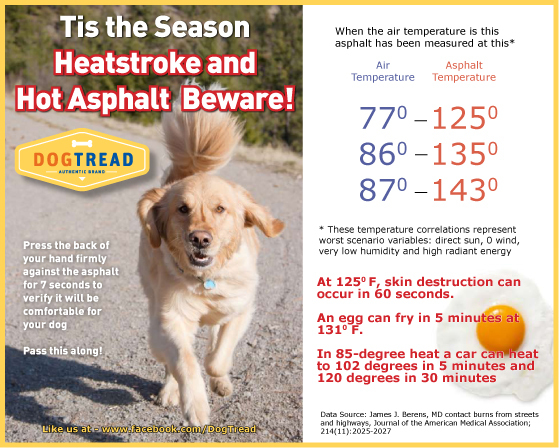 Check the heat of the surface you are going to ask your dog to run on. You are wearing running shoes as a barrier to the surface, puppy is not so lucky. 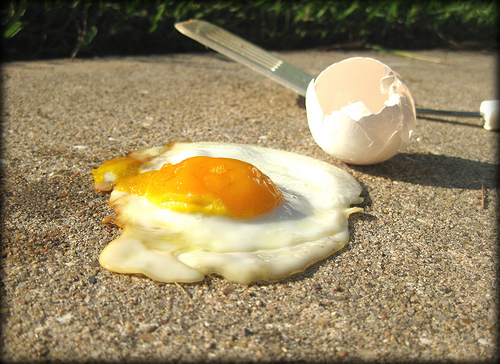 Grass can feel like sandpaper, Pavement can cook an egg, just think about your poor pup's paws ! then this is a good sign that puppy can walk on it. IF you can't, then do not take puppy on it. Common sense. unlike humans that have clothing and hats as barriers to the hot radiant heat from the sun. One dog show I was at in the summer, I patted a black dog and almost burnt my hand ! In the same token, in the winter if you are walking your dog outside, they should be wearing boots. Just pick up some sidewalk salt and hold it in your hand to know what your puppy will feel on their feet. there is also balm you can apply to puppies feet but this is just not as effective or clean as the boots. Dogs can also overheat outside if owners make them wear coats, or again exercise too much. You have to really watch your dogs to make sure they don't get hypothermia or overheat in the winter as well. Dogs do not sweat like humans do. They dissipate the heat via panting and through their paws. Only these two areas. Just stop and think how ineffective this is on the hottest day. 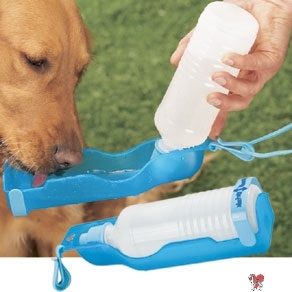 as this can cause fluid to accumulate on the lung by puppy inhaling it. Never share water dishes with strangers, as you never know what disease can be there. you need to cool him off as soon as possible !! Just like heat stroke can be fatal to humans, hyperthermia can be fatal to your beloved pet. or if there is excessive humidity, or humidex warnings, it is best to leave your dog at home. The risk at this point for heat stroke far exceeds the benefit for exercise. Most often you will be running in the early morning or after the sun is going down in the evenings. NEVER run in the middle of the day with your dog. 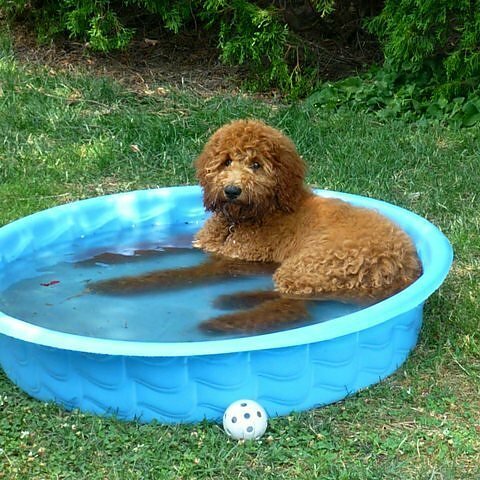 If your pet ever does over heat it is best to submerse in cool water as soon as possible. laying inside their ear flaps, under testicles. available and or classes, for you to learn how to help your buddy do his best for you. Bring baggies. Your puppy came with poop scoop bag dispensers, that can be attached to your belt. PICK UP ! When coming up to strangers, know that humans have the right of way. Some people are really afraid of dogs, so put your dog to the outside with you passing on the human's side. !! RULES OF WALKING YOUR DOG !! It is paramount that you start walking your puppy in public as soon as you can. It is of great benefit if puppy knows the command "sit, wait". You should try to have some treats in your pocket that strangers can give your puppy for sitting. so that they meet and great people and learn that people are nice. You want your encounters to be civil and controlled, so the early walks, while your dog is still a puppy, and small in size. Early socializing will be important for setting the ground rules for walking and meeting behaviour for the future. and this is why a puppy obedience class works wonders for setting the foundation for how your dog behaves in public. 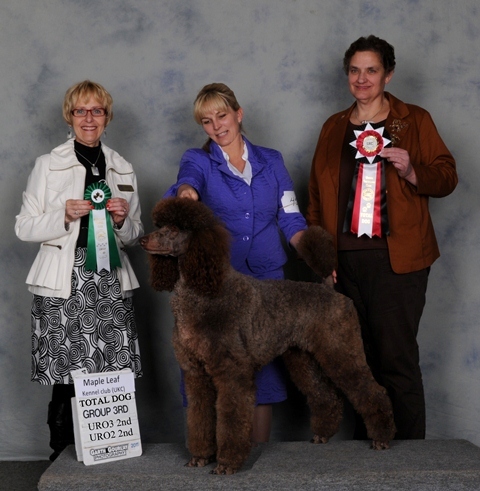 Please choose a class put on by local AKC or CKC dog clubs if at all possible. Always walk your puppy with a slack leash. This means that your leash should have a "U" shape. 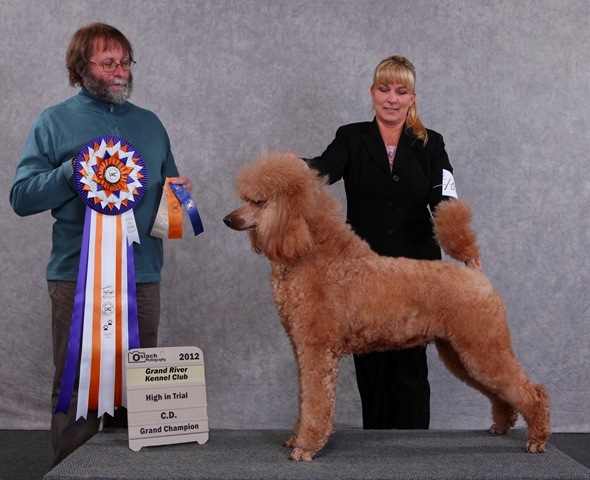 Both verbal and physical (body language) cues are important when meeting new dogs and their people. 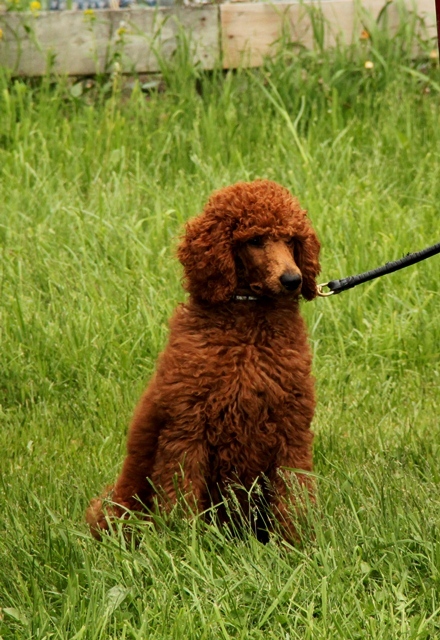 Try not to allow your body to tense up and do not suddenly tighten your grip on your dog’s leash. Your dog will get the message that something is wrong and will respond accordingly. 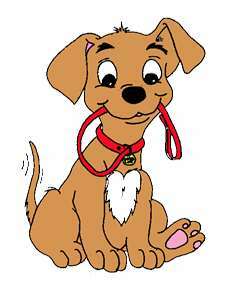 Your tightening your leash will result in a dog that will be very aggressive or a dog that will be very fearful. or a more submissive personality or one you trained to be submissive, may try to hide behind you waiting for you to protect them. The end result is the same,YOU have taught your puppy how to act. These are available at amazon, pet stores, or off their web page. prevents your inappropriate reactions from going down the leash to the puppy. and this is why it is so important to keep your dog on a leash at all times. of the other dog or cross the street. 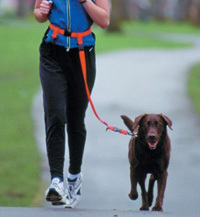 Continue to walk at a normal, steady pace, keeping your dog on a short leash, and your dog will follow. passed the other dog without responding in a fearful or aggressive way, verbally praise him and give him a training treat. so teach them you have nothing to fear. Act how you want puppy to react. When I have new dogs out on a walk I keep a pace that will not bore them. so I give a loud greeting, "good morning" in a happy carefree voice. This tells puppy I know this person and I'm ok with them. and then a praise when we slow down "good dog". If the person wants to pet my dog, I slow down and I give the command "puppy sit" (if they know this command), "wait". I take a treat out and hand it to the stranger. NO CORRECTIONS with the leash, no talking to puppy. A stranger with treats directs the puppy where to go to, gives puppy a target, which will be a treat low to the ground. This will teach puppy not to jump up on strangers for attention. Usually automatically people will say “sit, shake paw” and then give a treat, which is great extra training ! After a couple weeks of this, you will have a very polite trained puppy, that immediately sits to great strangers. then you may wish to consider a Dog Walker. We use a flat collar and move FAST to keep them engaged. After 6 + months of age you can learn to use a choke collar. If poodle gets distracted by squirrel or barking dog or anything.. Yeah... a learning opportunity.